Everybody is familiar with the famous Margarita, but did you know that there is another Tequila-based cocktail that may not be as well-known, but is equally delicious? 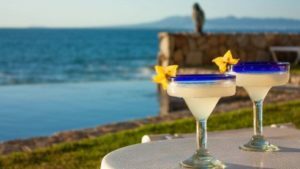 Let us introduce you to the Paloma, the perfect warm weather cocktail to enjoy during your stay in our luxury villa rental in Puerto Vallarta. Place the ground salt on a plate, then rub half of the rim of a highball glass with the grapefruit wedge and dip the rim of glass in salt. Combine grapefruit juice, lime juice, and sugar in glass; stir until sugar is dissolved. Stir in Tequila, add ice, and top off with club soda. Garnish with the grapefruit wedge.